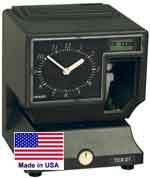 IN STOCK, and and excellent value: Atomic Clock - PIX200. Large LCD Display, prints large, clear time. Longest lasting ribbon. Quiet, reliable, attractive design. Portable, runs for 3 days/400 punches when unplugged. Rugged machine. Ships in 24 hours. HandPunch 3000E + TimeGuardian Software, 2 administrators, 500 employees, Department Transfers at the clock. 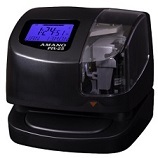 HandPunch 4000E + TimeGuardian Software, 2 administrators, 500 employees, Department Transfers at the clock. Amano Time Clocks. 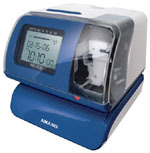 We sell and service Amano Time Recorders.